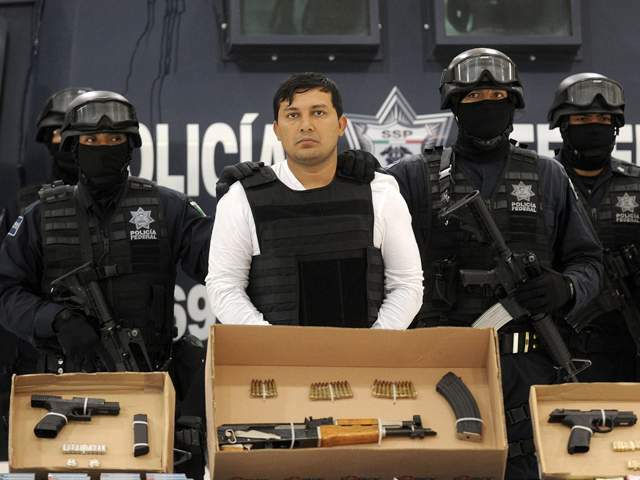 MEXICO CITY (Reuters) - Mexican police arrested a top lieutenant of the Zetas drug cartel who was linked to the murder of a U.S. immigration agent in February, Mexico's security ministry said on Monday. Police captured Jesus "El Mamito" Rejon in a Mexico City suburb on Sunday "without firing a shot," the ministry said in a statement. Rejon is a founding member and currently third in command of the Zetas, which was started by former Mexican special forces soldiers and is considered the country's most brutal cartel. Rejon was traveling with a Mexico City police officer who was brokering the drug lord's passage through the region, the ministry said. The police officer was also arrested. Around 40,000 people have died in Mexico's drug wars since President Felipe Calderon took office in December 2006. Calderon has deployed the military to the streets to attack the powerful cartels. The United States had offered a $5 million dollar reward for Rejon, who the Mexican security ministry said played a role in the shooting of two U.S. Immigration and Customs Enforcement (ICE) agents earlier this year. 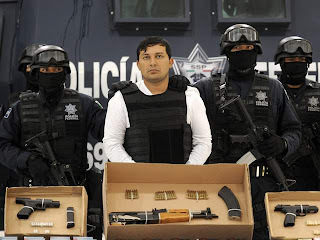 The agents were driving in an armored vehicle on a highway from San Luis Potosi to Mexico City in February when they were ambushed in broad daylight by suspected drug gang members. An ICE agent, Jaime Zapata, was killed and another agent, Victor Avila, was wounded in the leg.